Dame Valerie Kasanita Adams DNZM (formerly Vili; born 6 October 1984) is a New Zealand shot putter. She is a four-time World champion, four-time World Indoor champion, two-time Olympic, three-time Commonwealth Games champion and twice IAAF Continental Cup winner. She has a personal best throw of 21.24 metres outdoors and 20.54 m indoors. These marks are Oceanian, Commonwealth and New Zealand national records. She also holds the Oceanian junior record (18.93 m) and the Oceanian youth record (17.54 m), as well as the World Championships record, World Indoor Championships record and Commonwealth Games record. Adams was the third woman to win world championships at the youth, junior, and senior level of an athletics event, following the feats of Yelena Isinbayeva and Jana Pittman. She was the first woman to win four consecutive individual titles at the IAAF World Championships. Adams had a winning streak that extended to 56 wins at elite-level competitions, which started in August 2010 and ended in July 2015. (This streak may increase to 95, depending on the results of a doping ban against Nadzeya Ostapchuk, who was the sole challenger to Vili during this period.) She was the IAAF World Athlete of the Year in 2014 and the Track & Field News Athlete of the Year in 2012 and 2013. She had the longest shot put performance of the season every year from 2006 to 2014, bar 2008 when she was second to Natallia Mikhnevich (later banned for doping that year). Adams won silver medals at the 2016 Summer Olympics, 2005 World Championships in Athletics, and the Commonwealth Games in 2002 and 2018. She was also a bronze medallist at the 2016 IAAF World Indoor Championships. While still a teenager, Adams was a finalist at the 2003 World Championships in Athletics and the 2004 Summer Olympics. At national level, she has won fifteen shot put titles at the New Zealand Athletics Championships between 2001 and 2018, as well as having a hammer throw national title in 2003. Adams also won four times at the Australian Athletics Championships between 2004 and 2008. From 2006 to 2012 she was chosen as the New Zealand Sportswoman of the Year seven times consecutively and has been awarded the Lonsdale Cup on five occasions in recognition as the leading national athlete in an Olympic sport. In 1998 Adams met former javelin thrower Kirsten Hellier, who would become her coach for the next 11 years. Adams first came to prominence when winning the World Youth Championships in 2001, with a throw of 16.87 m. She followed this up in 2002 by becoming World Junior champion, throwing 17.73 m, and had her first taste of senior success winning a silver medal at the Commonwealth Games with 17.45 m.
She finished fifth at the 2003 World Championships at eighteen years of age. At her first Olympics in 2004, Adams finished seventh (after two athletes' subsequent disqualification), while still recovering from an appendectomy she had just weeks before the competition. The following year, Adams earned a place in the international elite, winning the bronze medal at the World Championships with a personal best throw of 19.87 m, The winner was Nadzeya Ostapchuk, but in 2013 the IAAF revealed that Ostapchuk's drug test sample from that event had been retested and found to be positive. Adams originally finished second at the World Athletics Final in 2005, but was promoted to gold after Ostapchuk's results were annulled. At the 2006 Commonwealth Games the 1.93 m-tall athlete won the gold medal, breaking the 20-year-old Commonwealth Games record of 19.00 m with a throw of 19.66 m.
In 2007, Adams went to the Osaka World Championships as a favourite to take a medal due to her being one of only three women to throw over 20 m before the championships. In qualifying, Adams led the field with a throw of 19.45 m. Adams held second place behind Nadzeya Ostapchuk throughout the final, but responded well in the last round with a mammoth throw and Commonwealth record of 20.54 m to take the gold. This made Adams one of few female athletes ever to take IAAF World Titles at youth, junior and senior level. In 2008 Adams broke the Oceania record in winning her first World Indoor Title in Valencia (20.19 m). At the Beijing Olympics, she qualified for the final with the longest distance thrown, 19.73 meters, on her first attempt. She won the gold with a throw of 20.56 m, a personal best, beating Belarusian thrower Natallia Mikhnevich. It was the first Olympic gold medal in track and field for New Zealand since John Walker won the 1500 meter race in 1976. She also won the New Zealand Sports Award of the year in 2008. At the 2009 Grande Prêmio Rio in Brazil Adams won the competition with a new personal best and Oceanian area record of 20.69 m. The throw was also the world leading distance for the event. In August, Adams won at the 2009 World Championships in Athletics in Berlin with a throw of 20.44 meters, ahead of the German Nadine Kleinert and Gong Lijiao of China. At the 2010 IAAF World Indoor Championships Adams was defeated by Nadzeya Ostapchuk by a large margin, in spite of the New Zealander setting a continental record of 20.49 m. Adams announced on 28 March 2010 that she would no longer be coached by Kirsten Hellier after an 11-year partnership. In April 2010 she announced her new coach was Didier Poppe. Adams was consistently beaten by Nadzeya Ostapchuk in the big meetings that season. She set a meeting record and season's best of 20.37 m at the Athletics Bridge meet in Slovakia, later saying that a change in her technique that April had begun to pay dividends. Later that season she won at the 2010 IAAF Continental Cup with a season's best mark of 20.85 m and also competed at the Commonwealth Games in New Delhi, where she set a Games record mark of 20.47 m to retain her title. In late 2010 Jean-Pierre Egger took over as her coach from Poppe. Adams won the 2011 World Championships equalling the championship record 21.24 met by Natalya Lisovskaya in 1987. At the 2012 World Indoor Championships Adams won the competition with a throw of 20.54 m, a new indoors personal best. Adams originally won the silver medal at the 2012 London Olympics but was promoted to the gold medal after the initial Olympic champion, Nadzeya Ostapchuk, failed two drug tests, one a day before the event and the second on the day of the event. The Belarusian Ostapchuk tested positive for metenolone which is classified as an anabolic agent on the list of banned substances. Adams later recounted how she initially believed Chef de Mission Dave Currie was "telling fibs" upon being told the news. She received the gold medal from the New Zealand Governor-General, Sir Jerry Mateparae, at a special ceremony in Auckland on 19 September 2012. Adams won her fourth world championship gold at the 2013 World Championships games in Moscow in August 2013. Her fourth gold medal surpassed Astrid Kumbernuss for most all time by a female shotputter and made her the first woman to win four straight titles in an event at the competition. On 27 September, Adams underwent surgery on her left ankle and right knee, and in March 2014 won her third world indoor championship at Sopot in Poland with a distance of 20.67 m. Her gold medal at the 2014 Commonwealth Games, where she was New Zealand's flag-bearer, was her 54th consecutive event win; the streak began in August 2010. Injury caused Adams to withdraw from an attempted defence of her shot put title at the 2014 IAAF Continental Cup and she was ruled out for most of 2015 season for the same reason. During this period she underwent surgeries on her shoulder and elbow in late 2014 and returned for a further operational on her knee in August 2015. Adams finished second in shot put at the 2016 Summer Olympics with a distance of 20.42 m. She was beaten by Michelle Carter who had a personal best of 20.63 m with her last put of the competition. In the 2017 New Year Honours, Adams was named a Dame Companion of the New Zealand Order of Merit. She skipped the entire track and field that season due to pregnancy. Adams came in second in the shot put at the 2018 Commonwealth Games on the Gold Coast, Australia, with a seasonal best put of 18.70 m.
Adams was born in Rotorua, New Zealand, to a Tongan mother (Lilika Ngauamo) and an English father (Sydney Adams). Her father, who settled in New Zealand after service in the Royal Navy, had a total of 18 children with five women. Adams' youngest sibling is NBA basketballer Steven Adams, and two other brothers played professional basketball in New Zealand. Their other sister, Lisa Williams, is an aspiring paralympic shot-putter and discus thrower as she has cerebral palsy. Adams was married to Bertrand Vili, a discus thrower from New Caledonia. They married in 2004 and divorced in early in 2010. Adams married Gabriel Price, a friend since childhood, at Temple View in Hamilton on 2 April 2016. She gave birth to her first child, a daughter named Kimoana Josephine Adams-Price on 11 October 2017. Adams' training base is at the Centre national de sport de Macolin in Switzerland. Butcher, Margot (2010). Golden Girls: Celebrating New Zealand’s six female Olympic gold medallists. Auckland: HarperSports/HarperCollins. pp. 106–127. ISBN 978-1-86950-892-0. ^ "Valerie Adams". sports-reference.com. Sports Reference LLC. Retrieved 17 January 2014. ^ Alderson, Andrew (2015-07-05). Val Adams finally defeated. New Zealand Herald. Retrieved 2018-04-22. ^ Alderson, Andrew (2017-11-05). Athletics: Dame Valerie Adams' record set for a boost. New Zealand Herald. Retrieved 2018-04-22. ^ "Doping: Five 2005 world medallists caught after IAAF retests". BBC Sport. Retrieved 9 March 2012. ^ "Revision of results following sanctions of Tsikhan and Ostapchuk". IAAF. 27 April 2014. Retrieved 11 May 2014. ^ "Valerie Adams says: Russia ban a favorable step against doping". 6 July 2016. ^ She was the third after Jana Pittman (2003) and Yelena Isinbayeva (2005). Veronica Campbell completed the set the day after Adams. ^ Biscayart, Eduardo (18 May 2009). "Vili sets 20.69m Oceania Shot Put record in Rio". IAAF. Archived from the original on 19 May 2009. Retrieved 18 May 2009. ^ Landells, Steve (14 March 2010). "EVENT REPORT – WOMEN's Shot Put Final". IAAF. Archived from the original on 29 June 2011. Retrieved 1 March 2011. ^ "Shotput champion Valerie Vili splits with coach". The New Zealand Herald. 28 March 2010. Retrieved 28 March 2010. ^ "Valerie Vili appoints new coach". stuff.co.nz. 13 April 2010. Retrieved 30 April 2010. ^ Juck, Alfons (24 August 2010). "Shot putters rule in Dubnica". IAAF. Archived from the original on 25 August 2010. Retrieved 24 August 2010. ^ "Tough year all worth it, says Adams". The New Zealand Herald. 14 November 2011. Retrieved 6 March 2012. ^ Landells, Steve (29 August 2011). "Women's Shot Put – Final – Threepeat for Adams, with a 21.14m Area Record". IAAF. Archived from the original on 1 August 2012. Retrieved 6 March 2012. ^ Brown, Michael (11 March 2012). "Adams completes set of world titles". The New Zealand Herald. Retrieved 12 March 2012. ^ "Valerie Adams falls short of shot put gold". Retrieved 7 August 2012. ^ a b Bryant, Tom (13 August 2012). "Belarus shot putter Nadzeya Ostapchuk stripped of gold for doping". London: The Guardian. Retrieved 20 August 2012. ^ "Valerie Adams thought gold medal phone call was a joke". RadioLive. Retrieved 14 August 2012. ^ "David Oliver wins hurdles gold". ESPN. Associated Press. 12 August 2013. Retrieved 13 August 2013. ^ Leggat, David (1 August 2014). "Commonwealth Games: Golden Val shows she's in a class of her own". The New Zealand Herald. Retrieved 1 August 2014. ^ More surgery for Valerie Adams. New Zealand Herald (2015-08-18). Retrieved 2018-04-22. ^ "Rio Olympics 2016: USA's Michelle Carter wins women's shot put gold with final throw". BBC. 13 August 2016. Retrieved 13 August 2016. ^ "New Year's Honours: Dame Valerie Adams blown away but still has more to achieve". Retrieved 31 December 2016. ^ "Result – Women's Shot Put Final". Gold Coast 2018. Retrieved 13 April 2018. ^ "Valerie Vili speaks out", hospice.org; retrieved 17 August 2009. ^ 12th IAAF Championships in Athletics, Berlin 2009 – Pressure free, Vili delivers second World Title Archived 19 August 2009 at the Wayback Machine; retrieved 17 August 2009. ^ a b Fittipaldo, Ray (7 October 2012). "Pitt big man Steven Adams' backstory is as interesting as his future is intriguing". Pittsburgh Post-Gazette. Retrieved 11 December 2012. ^ "Athletics: Lisa Adams betters world para shot put record". Newshub. Retrieved 9 March 2019. ^ "Valerie Vili speaks out". New Idea. Hospice New Zealand. p. 1. Archived from the original on 29 October 2007. ^ Taylor, Murray (6 February 2007). "Strong winds suppress results in Hamilton". IAAF. Archived from the original on 4 May 2016. Retrieved 28 April 2016. ^ "Vili changes name after marriage bust-up". The New Zealand Herald. 20 August 2010. Retrieved 13 August 2016. ^ "Dual Olympic shot put champion Valerie Adams weds for second time". Stuff.co.nz. 3 April 2016. Retrieved 3 April 2016. ^ Buckleton, Ophelia (22 July 2017). "Pregnant Dame Valerie Adams a 'machine' at the gym". The New Zealand Herald. Retrieved 28 September 2017. ^ "Dame Valerie Adams gives birth to first child, daughter Kimoana Josephine Adams-Price". Newshub. 11 October 2017. Retrieved 12 October 2017. ^ Rees, Peter. "Mum's the word for Valerie". Islands Business. Archived from the original on 17 February 2012. Retrieved 6 March 2012. 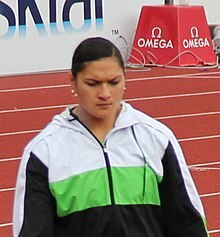 Wikimedia Commons has media related to Valerie Adams.